At a Solemn Tridentine Mass, the host is displayed to the people before communion. The Eucharist is a sacramental or memorial reenactment of the Last Supper between Jesus and his disciples, in which Christians partake in the "body" and "blood" of Christ. It is also known as Holy Communion. Christians generally recognize a special presence of Christ in this rite, though they differ about exactly how, where, and when Christ is present. Some believe that they partake of the literal body and blood of Jesus, which is transformed through the eucharistic prayer of the priest, while others believe in a "real" but not physical presence of Christ in the Eucharist, while still others take the act to be a symbolic reenactment of the Last Supper. The word "Eucharist" comes from the Greek noun εὐχαριστία (transliterated, "Eucharistia"), meaning thanksgiving. It is also applied to the bread and wine consecrated in the course of the rite. The majority of Christians classify the Eucharist as a sacrament. Some Protestants view it as an ordinance in which the ceremony is seen not as a specific channel of divine grace, but as an expression of faith and of obedience to Christ. Precursors to the Eucharist are found in a Jewish holy day and pagan rites. 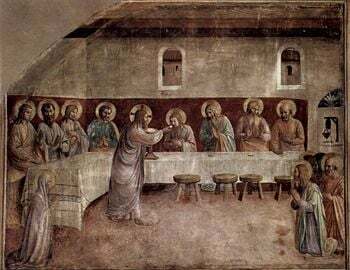 In Fra Angelico's Last Supper, Jesus dispenses the Eucharist. The three synoptic Gospels (Matthew 26:29, Mark 14:24, and Luke 22:19-20), as well as Saint Paul's first Letter to the Corinthians 1 Corinthians 11:23-26 contain versions of the words reportedly spoken by Jesus at the Last Supper: "Take, eat, this is my body... Take, drink, this is my blood... Do this in remembrance of me." All subsequent celebration of the Eucharist is based on this injunction. John 6 is also interpreted in connection with the Eucharist: "For My flesh is food indeed, and My blood is drink indeed. He who eats my flesh and drinks My blood abides in Me, and I in him" (John 6:55–56). Bible critics tend to take the view that these passages reflect the tradition of the early church at the time that the New Testament was written. In this view, the Last Supper was simply a Passover meal and only later became a memorial in which believers partake of Jesus' body and blood. The ritual thus developed as Christians dealt with the unexpected death of Jesus and reinterpreted the traditional idea of the Jewish Messiah as a spiritual savior sent by God to die for mankind's sins. "Eucharist" (from Greek Εὐχαριστία Eucharistia, "thanksgiving") is the term with the earliest established historical use. "Communion" (from Latin communio, "sharing in common") is a term used, with different meanings, by Catholics, Orthodox Christians, Anglicans, and many Protestants, including Lutherans; "Holy Communion" is also prevalent. "The Lord’s Supper" and "the Breaking of Bread" are terms that the New Testament (1 Corinthians 11:20; Acts 2:42, Acts 20:7) also apply to the celebration of the Eucharist. Other phrases also are used to describe Eucharist, including "Table of the Lord" (Mensa Domini), the "Lord's Body" (Corpus Domini), and the "Holy of Holies" (Sanctissimum). The Eucharistic celebrations of the early Christians were embedded in, or simply took the form of, a literal meal. While centered on the ritual of the bread and wine, the feast also included various other actions, sometimes including elements of the Passover seder and of Mediterranean banquets, funerary and otherwise. These were often called Agape Feasts. Agape is one of the Greek words for love, specifically meaning selfless love, or God's love for mankind. This ritual was apparently a full meal, with each participant bringing a contribution to the feast according to their means. It could at times deteriorate into merely an occasion for eating and drinking, or for ostentatious displays by the wealthier members of the community. This was criticized by St. Paul in the New Testament (see for example 1 Corinthians 11:20–22). The Eucharist proper was detached from the Agape meal between the first and third centuries for such reasons, and the Agape was definitively dropped by the Church between the sixth and eighth centuries. There have been various survivals and revivals, however. Monastic communities continued to share communal meals in a spirit similar to those of the ancient Church. In the eighteenth century, Pietist Christians began to hold Love Feasts that looked back to the ancient Agape. In the Tanakh, Melchizedek brought bread and wine to Abraham after Abraham's victory over the four kings who had besieged Sodom and Gomorrah and had taken Abraham's nephew Lot prisoner. Christians believe that Jesus is the Messiah spoken of as "a priest forever in the order of Melchizedek" (Psalms 110:4). At Passover celebrations, the blessing and partaking of bread and wine are a basic component of the feast. The Last Supper was apparently a Passover seder, presided over by Jesus. The Bacchic/Dionysian rites also included the sacramental partaking of wine and bread, with wine signifying the spirit and bread the manifestation of the spirit in matter, or the body. 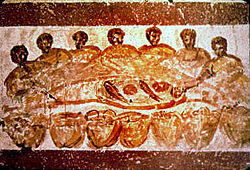 Elements of the Greek thanksgiving (eucharistia) may also have been adopted in the early centuries of the Christian era for the Sacrament of the Lord's Supper. Though theological interpretations have varied, the Eucharist has long been at the center of Christian worship. In general, the Roman Catholic, Orthodox, and some Protestant traditions see the Eucharist as the fulfillment of God's plan for the salvation of humanity from sin. Differences in Eucharistic theology tend to be related to differences in understanding of these areas. 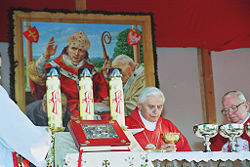 Cardinal Joseph Ratzinger, the future Pope Benedict XVI, celebrates a Mass. In the teaching of the Roman Catholic Church, the Eucharist is one of the seven sacraments, but is also considered the "the source and summit of the Christian life" (Lumen Gentium 11). "The other sacraments...are bound up with the Eucharist and are orientated toward it" (Catechism of the Catholic Church 1324). The only minister of the Eucharist, that is, one authorized to celebrate the rite and consecrate the Eucharist, is a validly ordained priest (either bishop or presbyter), who represents Christ himself and acts before God the Father in the name of the Church. The matter used must be wheaten bread and grape wine; this is essential for validity. According to the Roman Catholic Church, when the bread and wine are consecrated in the Eucharist, they cease to be bread and wine, and become instead the body and blood of Christ. This view has come to be known as transubstantiation. Holy Communion, in the sense of partaking of the consecrated elements of the Eucharist, may be given to Catholics either during Mass or outside of Mass, in which case it is normally given only in the form of bread. Like Roman Catholics, the Eastern Orthodox, Oriental Orthodox, Eastern Catholic Churches, and the Assyrian Church of the East believe that Christ is really, fully, uniquely present in the Eucharistic elements, and that, in the Divine Liturgy, the one sacrifice of Christ is made present. The exact means by which the bread and wine become the body and blood of Christ is a mystery. The Eastern tradition does not define any precise moment the change occurs. 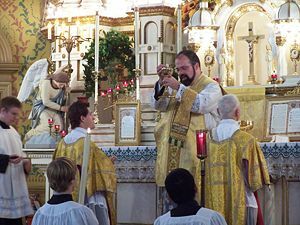 As in the Roman Catholic Church, any of the consecrated elements, or "holy gifts," that remain at the end of the Divine Liturgy are normally consumed by a priest or deacon. The historical position of the Anglican Communion is found in the Thirty-Nine Articles of 1571, which state "the Bread which we break is a partaking of the Body of Christ"; and likewise that "the Cup of Blessing is a partaking of the Blood of Christ." The Articles also state that adoration of the consecrated elements was not commanded by Christ and that those who receive unworthily do not actually receive Christ but rather their own condemnation. Anglicans generally and officially believe in the "Real Presence" of Christ in the Eucharist, but the specifics of that belief range from transubstantiation to something akin to a belief in a "pneumatic" presence. In the Lutheran Book of Concord, Apology XXIV.1, it is asserted that among Lutherans Holy Communion is celebrated weekly. However, disagreement exists across the various Lutheran bodies regarding the appropriateness of the term Eucharist. Some Lutherans, particularly those who reject high church theology, object to the term because it ostensibly puts the emphasis on human response. Lutheran groups that accept the term note its use throughout the Lutheran Confessions in the Book of Concord. Lutherans believe that the Body and Blood of Christ are "truly and substantially present" in the consecrated bread and wine, so that communicants eat and drink both the elements themselves and the true Body and Blood of Christ (Augsburg Confession, Article 10). The Lutheran doctrine of the Real Presence is often referred to as "consubstantiation" by some, but this term is rejected by Lutheran Churches and theologians as it creates confusion with an earlier doctrine of the same name. The Methodist Church believes in the Real Presence of Jesus Christ in Holy Communion, but generally rejects the notion that the bread and wine are literally transformed into Jesus' body and blood. Most Methodist Churches use grape juice for "the Cup," and either leavened yeast bread or unleavened bread. The juice may be distributed in small cups, but the use of a common cup and the practice of communion by dipping the bread into the common cup is becoming more common. Methodists typically kneel at the altar to receive communion, but based on individual need or preference, may stand or be served in the pew. In 2004, the United Methodist Church reaffirmed its view of the sacrament and its belief in the Real Presence in an official document entitled This Holy Mystery. Many Reformed Christians hold that Christ's body and blood are not locally or literally present in the Eucharist, but to the faithful believer Christ is indeed present. "The flesh and blood of Christ are no less truly given to the unworthy than to God's elect believers," John Calvin said; but those who partake by faith receive benefit from Christ, and the unbelieving are condemned by partaking. The faithful partaker beholds God incarnate in the Eucharist, and in the same sense touches him with hands, so that by eating and drinking of bread and wine Christ's actual presence penetrates to the heart of the believer more nearly than food swallowed with the mouth can enter in. Calvin specifically rejected adoration of the Eucharistic bread and wine as "idolatry," however. Leftover elements may be disposed of without ceremony, or reused in later services. Some Protestant groups see the bread and wine as a symbolic meal, a memorial of the Last Supper and the Passion in which nothing miraculous occurs. This view is known as the Zwinglian view, after Huldrych Zwingli, a Church leader in Zurich, Switzerland during the Reformation. It is commonly associated with Baptists and the Disciples of Christ. As with the Reformed view, elements left over from the service may be discarded without any formal ceremony, or if feasible may be retained for use in future services. Some of the Reformed hold that Calvin actually held this view, and not the Spiritual feeding idea more commonly attributed to him; or that the two views are really the same. To Latter Day Saints (or Mormons), the Eucharist (in LDS theology it is "The Sacrament") is viewed as a renewal of the covenant made at baptism. As such, it is considered efficacious only for baptized members in good standing. However, the unbaptized are not forbidden from communion, and it is traditional for children not yet baptized (baptism occurs only after the age of eight) to participate in communion in anticipation of baptism. According to the Sacrament prayers, a person eats and drinks in remembrance of the body and blood of Jesus, and promises always to remember him and keep his commandments. In return the prayer promises that the participant will always have the Spirit to be with them. 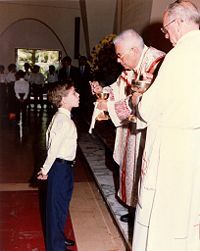 In the Western Church, the administration of the Eucharist to children requires that they have sufficient knowledge and careful preparation to receive the "body of Christ" with faith and devotion. Christian denominations differ in their understanding of whether they may receive the Eucharist together with those not in full communion with them. Closed communion was the universal practice of the early Church. The famed apologist St. Justin Martyr (c. 150) wrote: "No one else is permitted to partake of it, except one who believes our teaching to be true...." For the first several hundred years of Church history, non-members were forbidden even to be present at the sacramental ritual; visitors and catechumens (those still undergoing instruction) were dismissed halfway through the liturgy, after the Bible readings and sermon but before the Eucharistic rite. The older Churches, such as the Roman Catholic and the Eastern Orthodox exclude non-members from Communion under normal circumstances. Many conservative Protestant communities also practice closed communion, including some conservative Lutheran Churches. The Mennonites and the Landmark Baptist Churches also practice closed communion, as a symbol of exclusive membership and loyalty to the distinctive doctrines of their fellowship. Most Protestant communities, however, practice open communion, including some Anglican, Reformed, Evangelical, Methodist, and liberal Lutherans. Some open communion communities adhere to a symbolic or spiritual understanding of the Eucharist, so that they have no fear of sacrilege against the literal body and blood of Christ if someone receives inappropriately. Others feel that Christ calls all of his children to his table, regardless of their denominational affiliation. Many churches that practice open communion offer it only to baptized Christians (regardless of denomination). All Links retrieved August 13, 2017. Real Presence Eucharistic Education and Adoration Association Home Page: Eucharistic Miracles www.therealpresence.org. Jewish Encyclopedia: Lord's Supper jewishencyclopedia.com. The Ordinary of the Sacred Liturgy according to the Roman Missal of 1962 www.sacred-texts.com. 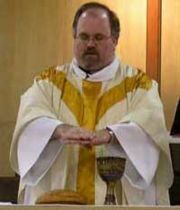 EWTN—The Holy Eucharist: Catholic Teaching on the Eucharist www.ewtn.com. The Sacrament of the Eucharist Catechism of the Catholic Church, Libreria Editrice Vaticana. Eucharist Catholic Encyclopedia, New Advent. Celebrating Eucharist by Bosco Peters, www.liturgy.co.nz. This page was last modified on 13 August 2017, at 14:40.